....ME! Yep, today I am another year older, and it's one of those darn milestone birthdays, too. You know, the ones that mean the passing of yet another decade, which makes you feel really old decrepit ancient fortunate to have survived this long! Which milestone is it? Well, let's just say it's one score and seven less than Lincoln's Gettysburg address and leave it at that, okay? Am I depressed? Oh, HECK no! I'm amazed I've made it as long as I have, and besides, 60 is the new 40, right? (Oops.) And, honestly, I still feel like I'm in my thirties, so it's all good! Isn't it just the sweetest, cheeriest thing you ever saw? The Watercolor Wonder Designer Notecards are adorable, and all you have to do is stamp something quick and send it! The background color is already on the note cards, and it's sturdy watercolor paper, too, so you can watercolor to your heart's content without worrying about the paper getting all wonky. Plus, you get 20 assorted cards (4 ea. of 5 designs) and envelopes for just $12.95! Such a deal!!! The tulips from Blessed Easter was used here (without the greeting), because they were the closest thing I could find to buttercups. Stamped it once, used the Happy Watercolor "wash" stamp and then colored the leaves with a marker. Then stamped again on scrap watercolor paper and colored the flowers and leaves with markers, cut them out and adhered them with dimensionals. Look at you mixing all these wonderful products! Beautiful card! Happy birthday to you... you definitely don't look your age. Thank you, Heidi, both for the birthday wishes and lovely compliment! Best wishes for your Birthday! Mine's today and I know what you mean about those milestone ones........they creep up on you! The card is beautiful. 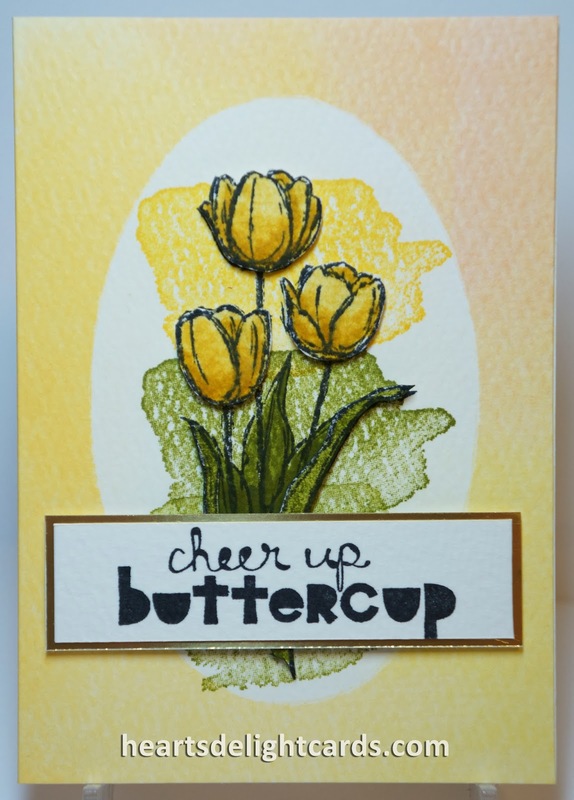 I love that you used the tulips instead of buttercups. Looks perfect. What a gorgeous and yes, cheery card! I really hope your birthday was amazing!